Have you been Googling the benefits of a new conservatory roof,? You’ll be keen to find an installer in Surrey with the knowledge to help your home improvement project off the ground. Castle Conservatories uses a market-leader as its preferred manufacturer, so you can buy from us with peace of mind. The benefits of a new conservatory roof are many when you choose us as your local installer. We offer a range of choices with aesthetically pleasing designs to deliver market-leading performance. Our systems, once installed, will add practical and market value to your home extension project. To discover the benefits of a new conservatory roof professionally installed by the Castle Conservatories team, visit our dedicated Virtual Reality Tour app. Click on features of interest to learn more about them and decide which product suits your aims. When you’re ready to book an appointment, ask us a question or request a quote, call our team directly on 020 8669 1500 or request a call back by emailing info@castlecon.com, in which case we will call you back as a matter of high priority. 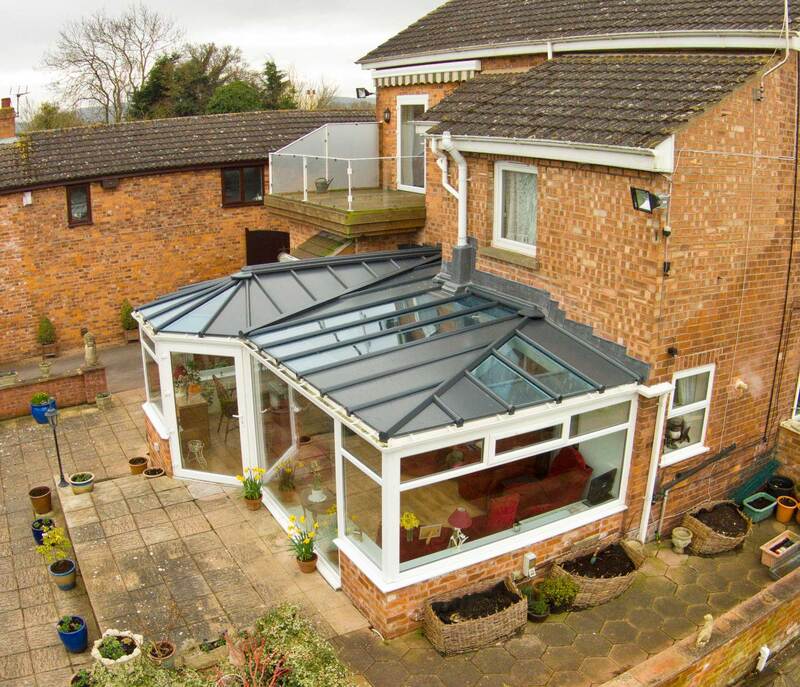 Not every conservatory roof is suitable for all home extension projects. That’s why we offer a wide variety of systems. Tiled Conservatory Roofs. This tiled conservatory roof is lightweight and installed without encountering problems with building regulations or planning permission. Glazing can be inserted in full-height format or as Velux windows, so you can choose how to illuminate your room. Solid Conservatory Roofs. Do you want to understand the benefits of a new conservatory roof that’s tiled? Our solid option will let you choose the shape of your glazing and allow you to control where it’s placed. This thermally efficient roof will include an internal pelmet that’ll add that all important ‘real room’ feel. Glass Conservatory Roofs. If you want to create a room that connects to your garden, a glass conservatory roof will benefit you. Meeting the requirements of your Surrey project fully. You’ll also be able to request wide spanning bi-fold or patio doors to improve views, access and ventilation. To discuss the benefits of a new conservatory roof with the Castle Conservatories team, contact us today for an informal discussion. One of the benefits of a new conservatory roof is that you’ll gain an extra space to use for a variety of purposes. Convert your conservatory, orangery or extension into a dining room, work area or living room. Add instant market value to your Surrey home. Prospective vendors will be able to see development potential in your home and feel more inclined to buy. Have you recently bought or inherited a home with a conservatory? If the roof is making your room too cold during winter and far too hot in summer, you may want to start from scratch. Our market-leading products mean you can renovate instead or rebuilding – saving you time and unnecessary expense. Choose Castle Conservatories to enjoy the many benefits of a new conservatory roof. Our systems are designed to meet planning permission requirements and building regulations for your peace of mind. For example, our tiled conservatory roof is lighter than any other equivalent system and won’t place pressure on your frames or foundations. Our solid conservatory roof can be fitted without interconnecting doors. Avoid the bureaucratic red tape that can often slow down home extension projects. Discuss your ideas with a member of our team today by calling 020 8669 1500 or sending an email with further details to info@castlecon.com. Take a walk through any of our conservatories, orangeries and extensions by using our brand new Virtual Reality Tour tool today instead. Or, if you need a price in a hurry, head over to our dedicated conservatory design tool to get a free quote on your mobile, tablet, laptop or home PC.